METTLER TOLEDO’s UV/VIS (Ultraviolet-Visible Spectroscopy) Excellence Spectrophotometers offer superior optical performance and comply with strict Pharmacopeia standards. An intuitive interface, pre-verified methods, and colour measurements are all expertly bundled in one small, robust instrument. The combination of array technology and a long-life xenon light source allows for full spectrum scans within seconds, significantly cutting down maintenance costs. 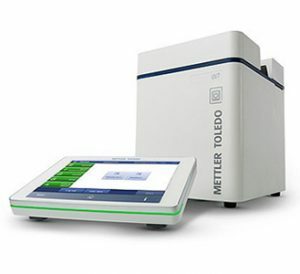 Enjoy the flexible operation of a stand-alone instrument, or power your bench with LabX® PC software to optimize data integrity, and connect multi-parameter systems with other METTLER TOLEDO instruments. The UV5Nano is a dedicated micro-volume spectrophotometer which performs accurate and reproducible micro-volume measurements with only 1 µL of sample. LockPath™ technology prevents the sample from drying out and allows a wide concentration range to be measured. This powerful compact instrument, which focuses on life science spectrophotometry applications, offers both cuvette and micro-volume measurements on the stand alone instrument, or with LabX® PC software. LabX® UV/VIS PC Software adds work-flow flexibility and supports compliance with regulations such as 21 CFR Pt 11. The combination of LabX® and Excellence spectrophotometers allow for complete customisation of UV/VIS workstations to the workflow in the lab. The laboratory solution performs calculations, reports, and data-management, saving time for operators and lab managers, and reducing the risk of transcription errors.